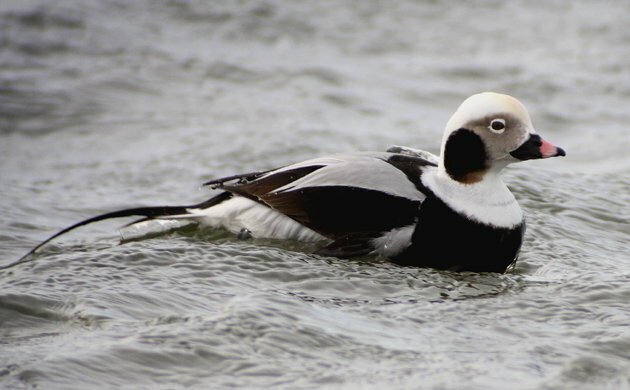 Long-tailed Duck is one of my favorite birds that we see on the Christmas Bird Count. For some reason, probably related to my having been exhausted after spending the entire day birding for the Queens County Christmas Bird Count, last year, after our compilation dinner, I agreed to be the compiler for the count starting this year. Compiling a Christmas Bird Count is much more complex, especially for a count that is in a bit of flux as the Queens count is. Over the last several years quite a few long-time count stalwarts have either passed away or moved away, leaving gaps in coverage to be filled. Many years of experience have been lost. Boundaries between sectors of the count, never very clear to begin with, have blurred to the point that no one was quite sure about what areas, exactly, should be covered by each party. Heck, finding a map with our circle drawn on it was almost impossible. And the compilation dinner? We haven’t had a regular spot to hold it since the birder who always hosted the potluck dinner died something like a decade ago. Over the last several weeks I have putting in the work to the Queens County Christmas Bird Count because I want it to be known as a good count, because I want to use it as a tool to involve new birders in Queens, and because I want to beat Brooklyn. But before I get into all of that I should first get into the history of the count. For eighty years now, the birders of Queens have given up one day in December to participate in the Queens County Christmas Bird Count. For thirty-five of those years the compiler was Bob Dieterich, who passed the reins to Ian Resnick in 2008, the year I did my first count. There have been 221 species recorded on the count, including goodies like Gyrfalcon, King Rail, Western Tanager, Ash-throated Flycatcher, Sedge Wren and Black-throated Gray Warbler. This is pretty impressive for the cold northeastern United States. During that long history there have been a couple of hiccups. First, during World War II, there were a few years when the count did not take place, for obvious reasons. Second, in the early 1950’s, there arose a dispute between those doing the Queens count, the Brooklyn count, the south Nassau County count, and the north Nassau County count. To understand why, you need to understand that Christmas Bird Counts areas were not always so clear as to boundaries. In the earlier years of the counts, the standard fifteen-mile diameter circle used to delineate the counting area of a particular count was not applied. Bird clubs would start a count in their general geographical area and count traditional locations. Eventually, when the circle was adopted, it was discovered that some circles overlapped. This should not be because, after all, you don’t want people counting the same birds. The New York City area’s Christmas Bird Count density is absurd. The Queens count circle is the one in the middle. Anyway, the settlement Cruickshank enforced so disgusted the Queens County Bird Club that they apparently did not submit their count numbers to the National Audubon Society for a decade, even though they kept doing the count. Eventually, cooler heads prevailed, and the club once again submitted their count numbers to Audubon, but no one was happy about it and lingering resentment about our loss of turf still sometimes comes to the surface (like when Queens birders write blog posts about wanting to beat Brooklyn). Anyway, in addition to making sure that I have people to cover our turf, I have to make sure that I have a complete understanding of our turf and that the counts around us also have that same understanding. The Brooklyn-Queens border is well understood, with Cruickshank having carved a wedge out of our count with all of the land west of Cross Bay Boulevard and south of Route 27 going to Brooklyn. This means that the West Pond of Jamaica Bay Wildlife Refuge goes to Brooklyn, which in past years has made us angry but since Hurricane Sandy this has been less of a loss for the count, seeing as the West Pond is now, sadly, a tidal mud flat, having been breached by the storm surge. From all that I understand, both counts have respected the borders since the judgment was made. Once I figured out exactly where we could count I turned my energy to making sure we had enough people to cover everything. I have recruited through word-of-mouth and the New York Birders Facebook page. Happily, I have managed to line up quite a few new counters for the Queens count and am sure that we will be able to cover all of our turf. The hard part is figuring out which birders should go where, which led me to realize that I not only had to consider things like the relative skill levels of different birders, but their personalities and possessions, car and spotting scope being the most important. 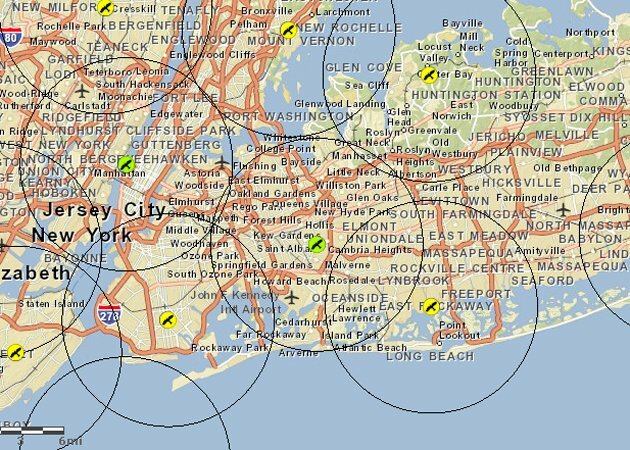 I am even working on trying to either get access to JFK Airport or to get an employee of the airport to count its expansive grounds, which are apparently good for such species as Snow Bunting, Horned Lark, and Snowy Owl. It used to be covered for the count but since 9/11 security has not allowed it. Hopefully, we will find a way to get access. Our dinner plans are what are driving me a a bit nuts now. We have a location, the Alley Pond Environmental Center, which is nice, but we haven’t yet made a decision to do a potluck or try to have a catered (cheaply). This should sort itself out shortly and I’m hoping we can start a new tradition of wrapping up each Queens County Christmas Bird Count in the same building the Queens County Bird Club regularly holds its meetings. Do you compile a Christmas Bird Count? What advice can you give me, a newbie compiler? And if you want to participate in the Queens County Christmas Bird Count on Sunday, 15 December, just drop me an email at corey@10000birds.com. *Named, apparently, for Dr. Lymon Langdon, one of the founders of the North Shore Audubon Society (that formerly was known as the Lymon Langdon Audubon Society). 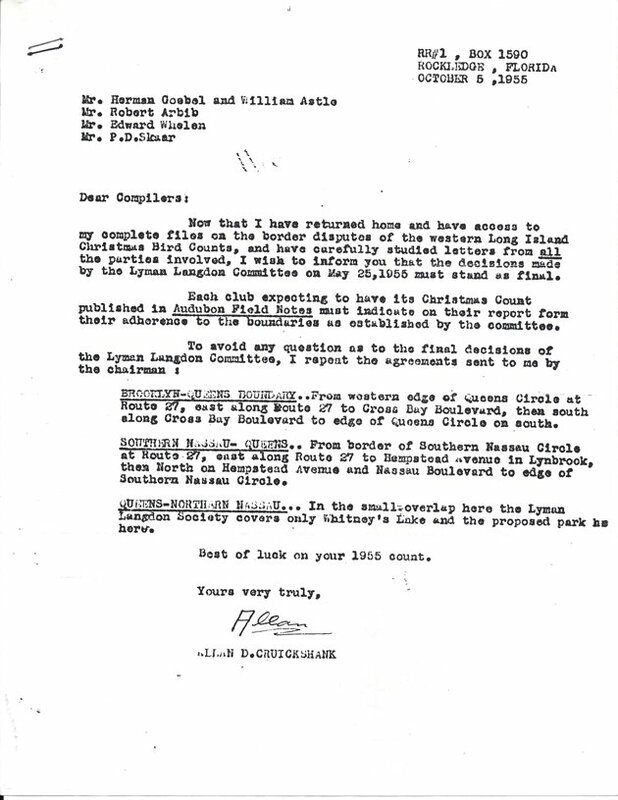 Why one of the clubs would get the committee charged with resolving their dispute named after their honorary president is lost to time, though I, for one, find it supremely fishy. The southern Nassau count probably should have been centered farther to the east since there’s a big chunk of uncovered territory in that direction and a big chunk of overlap to the west. Queens overlaps with a paltry 4 CBCs, while Brooklyn overlaps with 5. Also, while complaining about the tiny bit of territory you lost, you seem to have neglected the fact that Brooklyn lost a chunk of Jamaica Bay almost as big as what Queens lost, including the East Pond (which is now MUCH better than the West Pond for the foreseeable future). Also, Queens has WAY more actual land to cover than Brooklyn does, as roughly HALF of the total area of the Brooklyn CBC is water. So yes, cry me a river. I’ll cry you the East River. I guess this kind of territorial behaviour is impossible to understand for people outside – what – the wider NYC area? The US? Isn’t the goal of the CBS to gather comprehensive data collectively? Shouldn’t it be completely unimportant who counts what so long as all gets counted? After all, those who “lost” a piece of their count circle can count that area 364 days a year. What is the problem? Surely not a loss of fame and fortunes? This story makes me shake my head in amusement! Jochen, it does seem kind of weird but there is pretty intense competition between circles to get the highest number of species. This is tacitly endorsed by Audubon, as they highlight the counts in each region that get the most birds. For the record, I think Corey is manufacturing this competition, as I (and almost every other person I know who does CBCs) do not see CBCs as competitive. For the record, I think Corey is **mostly** manufacturing this competition, as I (and almost every other person I know who does CBCs) do not see CBCs as competitive.